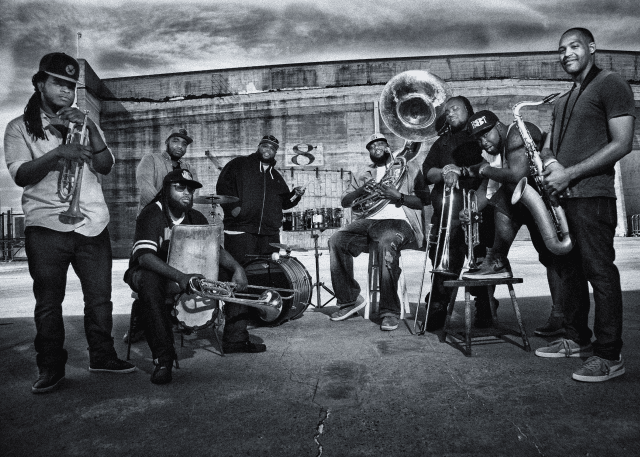 The Hot 8 Brass Band available for US and Canada bookings only. For over 20 years the Hot 8 Brass Band has set the precedent as one of the most popular and visible funk-style brass bands. In 1996 sousaphone player Bennie Pete, alongside two former Fortier High School student groups, the High Steppers and the Looney Tunes Brass Bands, united to form the Hot 8. And they have been playing in perfect harmony ever since. The players grew together and maintain a strong, family-like bond even after two decades of performance. With most members being born between 1975 and ’87 in a generation that grew up hearing mainly modern-style brass bands in community functions. The endemic New Orleanian swaggering of the Hot 8 sound can mainly be accredited to a steady stream of creative original concepts composed or introduced by its various band members. Each reflecting the reality of living in a city as dynamic and unyieldingly creative as New Orleans. Without losing touch with the city’s rich, sometimes tragic history. The Hot 8 Brass Band story reflects this narrative of tragedy and triumph. Over the years the Hot 8’s ranks have been decimated by the untimely deaths of four original members to street violence and illness. Hurricane Katrina was a life-altering turning point; after being evacuated, displaced, and scattered across the country, the band regrouped and began touring the United States to encourage and support other displaced Katrina victims and promote New Orleans’ recovery. After also performing abroad, they opened on tour for popular R&B rapper and singer songwriter Lauren Hill for six months. The Hot 8 was featured in two Spike Lee documentaries, When the Levees Broke (2006) and If God Is Willing and Da Creek Don’t Rise (2010), bringing them a measure of national and international exposure that has helped to fuel a steady touring schedule. Altogether the Hot 8 brass band has bucket loads of history to scream about and has bucket loads more to make.